« Why do we Subtract when we could be Adding? 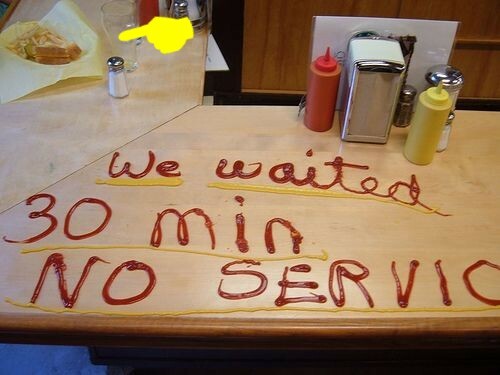 Are examples of Good Customer Service harder to remember than Bad Ones? Can you think of a good example? As part of our PR courses for small business we always emphasise that PR is about “managing your reputation“. Your PR firm can play a valuable part in that process but any efforts here are totally worthless if a business can’t create the right reputation building blocks by providing good customer service. We make this point on our courses and conduct a small exercise by asking the participants if they can give us examples of good customer service. This exercise always surprises me as we often see some repetition with names of businesses that are mentioned – for example at two recent courses Apple were mentioned for their “no quibble” approach to problems. Nash19 always get a mention in courses that we run in Cork. The examples given are always intriguing and often they relate to how a problem or an issue was dealt with. At a recent class we conducted this “good customer service” exercise and the first person to respond launched into a bad experience she had with a mobile broadband provider. I stopped her in her tracks and emphasised that it was examples of “good” customer service that we were actually looking for. She nodded politely as if she had grasped my point …. She then continued to tell the group in detail, blow by blow how lousy the service was! The whole group broke into laughter as we witnessed first hand how enthusiastic we are about sharing “bad” experiences. In our most recent course I continued asking the other participants for their examples of good service and I was surprised to come to another person who again could not give me an example of good customer service … Not one! “You’ll think of one in a minute, I’ll come back to you” I said , giving them an extra few moments to think of an example. Once again I continued asking the others for their examples. My own example that I shared with the group happened quite recently in West Cork. At the Celtic Ross Hotel recently I was running a Social Media course early in the morning. As I arrived a hotel staff member looked after me, took me to the well equipped and very comfortable conference room and then asked me if I wanted a coffee ….godsend! Wow ….that’s great service – I shared my story with the group. To finish the customer service session I went back to the two ladies who earlier could not think of an example. This just amazed me ..
Is customer service so bad that some of us never have a good experience or is it that we just remember the bad? PR starts with good customer service. This entry was posted on April 21, 2012 at 12:18 am and is filed under Customer Care, Hospitality, Marketing, PR. You can follow any responses to this entry through the RSS 2.0 feed. You can leave a response, or trackback from your own site. Very true. I am the lucky driver of a leased car, a Skoda. I had recent cause to visit the dealer (and I have no problem mentioning them), Tarrant’s, Banteer, Co. Cork. The simple courtesy was a delight. They fixed me up and sent me on my way, without them earning a penny from the transaction. A free car wash was given to me, also, a nice touch. Contrast this with many in the industry who will fleece you without question. I did pass on my compliments to my Leasing Company (another great Cork Company, by the way, Johnson & Perrott) and SKODA Ireland. I try to take time out to compliment those who deserve it. Life and business is hard enough without getting praise when it is deserved. It’s just harder to make a decent plot out of a situation which is about making the status quo a bit nicer. It’s another version of the problem John Milton faced when he wrote Paradise Lost, and accidentally made Satan cooler than God. We love drama and villains, and that can make it tricky to get good news stories about businesses out there. Completely agree with what you are saying here. In my line of work, customer service is absolutely paramount from start to finish, and the receiving of good customer service is appreciated, but ends there. The story only gets passed on if the service is great, excellent or exceptional…! But the story got around, and as a result, people have been talking, and the business will probably see more customers in as a result. People are looking for more than just the product and its pricing now, they are looking for that extra touch, and that wow factor. I think if people go to a hotel or restaurant, vs. going to a hostel or supermarket, they are paying a good bit extra, and so people expect to be catered for and looked after. So people are not surprised when they are looked after, and most people are happy with simply that, but yes there are always little things than can be done. I’m always using the internet on my phone, and so I always appreciate when the staff at a hotel, pub or restaurant are happy to charge it for me if it goes dead. I also love free nibbles on arrival in a restaurant or pub, and offers to box up uneaten food for take-away. Something I saw at a wedding venue too was a very well-stocked bathroom – a little basket in the ladies’ with everything from deodorant to paracetamol to hand cream. Nice touch.